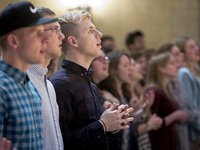 Several locations are available for spring break immersion trips. You are invited to join a group of students to see first hand the power of community. We will work along side the Mobile Loaves & Fishes Ministry. You will have the opportunity to have your hearts, minds and hands be engaged with learning the meaning of "home." Mobile Loaves & Fishes began when five parishioners of St. John Neumann Catholic Church in Austin, Texas, boldly answered God’s call to “love your neighbor as yourself.” Alan Graham and his friends began delivering meals out of the back of a minivan to men and women they found living on the streets. Graham readily admits that the group’s original approach for serving the homeless had some flaws, but with the help of a formerly homeless man they perfected the model that Mobile Loaves & Fishes successfully uses today. Complementing its truck ministry, Mobile Loaves & Fishes is also the visionary behind Austin’s innovative Community First! Village — a 27-acre master planned development that provides affordable, permanent housing and a supportive community for the disabled, chronically homeless in Central Texas. Additionally, Mobile Loaves & Fishes’ Community Works program provides micro-enterprise opportunities that enable formerly homeless men and women to earn a dignified income, develop new skills and cultivate enduring relationships as they take part in a restorative journey home. View this video for additional information. This is a new trip shifting the paradigm in understanding what it means to be "home". A portion of this trip will be dedicated to serving in an after-school program, SafePlace, that is committed to loving those who are at risk in the community. They do this by providing holistic, God centered-oriented programs and by functioning as a bridge for the community to the local church for the purpose of growth and multiplied reconciliation. *This is an all-female trip. Mile High Ministries envisions a city where families are transcending poverty, in part because churches and faith communities are helping in ways that are genuinely helpful and empowering. It is a city where communities are being led by those who were once labeled as least, last and lost. This vision draws its inspiration from scripture, which provides the breathtaking image of a city where those who were once poor now prosper, where children are no longer doomed to misfortune, and where unlikely partners live and work together in peace. This trip will include flights for travel rather than solely ground transportation. Bayshore Christian Ministries (BCM) has been impacting the youth and families in the East Palo Alto community for 25 years. As a part of this team, you will have an opportunity to work with a full-time, year round, urban ministry that focuses on the youth of the community — their spiritual growth and their education. Through classroom visits at local schools, participating in the BCM tutoring program and hearing from leaders in education from the community, you will explore the ways that race and economics are impacting access to an quality education in this country — and what Christians are called to do about it. This trip will include flights for travel rather than solely ground transportation. You are invited to come be a part of the work God is doing in Nashville by working alongside and supporting the efforts of people doing long-term ministry here, learning and gaining an understanding of the issues in Nashville, and being available to God and the opportunities placed before you. You will have opportunity to engage with staff and community members during the week. New Orleans has a rich yet complex legacy. Catholics and Protestants. Rich and poor. Democrat and Republican. Yankee and Southerner. Everyone is welcome, which is wonderful, but the other side of the city's story is riddled with oppression, corruption and neglect, oftentimes with Christian or religious undertones. With jazz and partying as its calling cards, somehow, someway, through tragedies like Hurricane Katrina, its people have continued to embody a spirited sense of resilience and unity. We will hopefully spend much of our time in the Lower 9th Ward, and otherwise visiting places like Musicians Village, Franklin Avenue Baptist Church, Canal Street Church and the Whitney Plantation. In preparation for the trip, during the fall of 2017, I will host a few gatherings where those interested can learn more about New Orleans with films like When the Levees Broke: A Requiem in Four Acts and If God is Willing and da Creek Don't Rise. Students may stay in guest housing at New Orleans Baptist Theological Seminary or somewhere close to the French Quarter if it isn't too costly. This is a new trip that will be led by Chaplain of Discipleship James Ellis. When most folks hear “Orlando” they think of multiple theme parks and high end vacations. While that is true it is also true that Orlando is a fascinating city with lots of ethnic and economic diversity. During our time in Orlando, we will immerse into an African American community. This trip has a strong emphasis on assessment development, understanding the difference between relief and development, immersion in a new culture, personal growth and forming a community. We also have a “fun day” planned either to the beach or some fresh water springs. It should be a ton of fun as well as impactful. Our ministry partner is Kaley Square Ministry. Their mission statement is “To cultivate a place of hope, connection and growth that equips youth for leading a thriving community.” It is led by Demetrius Summerville who will be serving alongside us as we seek to impact individuals and the neighborhood. The church is a large facility with plenty of space to house a large group. Students will need to bring their own bedding and air mattress if desired. This trip is available to Emmaus Scholars only. TIME has been partnering with national pastors and churches to change lives and bring hope through construction projects and discipleship programs. Whether you’re helping build a new church for villagers, or personally connecting one-on-one with nationals, we guarantee it will be an experience you will never forget.